When it comes to curb appeal of a house, nothing beats a well-cut lawn in the front and back of the property. Concrete is all well and suitable for driveways, but to give a home an edge; then it has to be grass. One other thing that many homeowners fail to realize when they put down concrete is that the hard surface does not help with drainage around the house. Hard surfaces can collect water, and it can seep into the footings and cause dampness inside the home. With grass, there is natural drainage back into the soil. It can also make the property cooler with the right planting, as the grass creates a cooling microclimate by taking moisture out of the air. There are two favorite ways for people to create a lawn. One is to use sod, which is pre-grown grass that comes in strips with its root system intact. The other is to start from seed. Both have their advantages; however if you want a long-lasting lawn, seeding is often the best option. In a few simple steps, an amateur gardener can lay a perfect lawn just like the professionals. Choosing the time of year to plant grass is crucial. 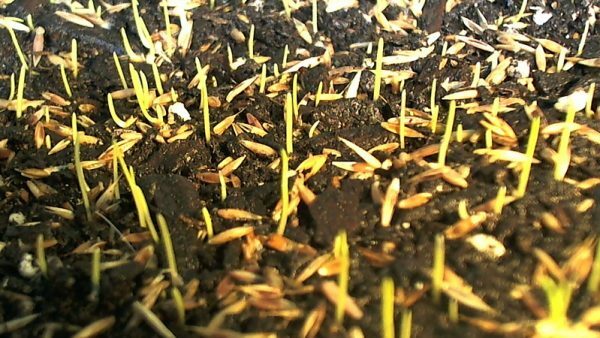 Getting the timing right means the grass seeds will have the best chance of germinating correctly, growing quickly, and getting the seedlings established. Not all grasses are the same and can be split into two distinct varieties. There are the cool growing season grasses, which are suitable for the northernmost climates, such as Northern Europe, the northern states of the US, or southern Australia and New Zealand. The warm season grasses are more attuned to the southern states of the US, or a Mediterranean climate. These grasses like to grow and establish themselves in the fall and winter. They should be sown when the ground still has some warmth from the summer and before the frosts arrive. The combination encourages faster germination, and the root system for the new plants establishes itself quickly. Ideally, cool season grasses need a ground temperature between 50F and 65F (10C-18C), which equates to an air temperature of about 60F to 75F (15C -24C). A cheap ground thermometer available at any good garden center will remove any guesswork. Of course, these temperatures all depend upon how far north you are, and the how warm was the previous summer. As a rule of thumb, most professional gardeners expect to plant cool season grass seed about 45 days before the first expected frost of the winter. The ground at this time of year will have a consistent moisture content, which makes it ideal for growing. The fall rains mean there is little chance of the new seedlings drying out. If you miss the fall planting, you can wait until the spring to seed your lawn with cool season grasses. However, it does make it more difficult for the seedlings to thrive. The ground is not as warm as the grass seed likes, and the spring rains can promote weed growth impairing the young grass shoots. For those living in a Mediterranean climate, warm season grasses are more appropriate. The grass seeds germinate in soils that have a higher temperature than cool season types. The ground temperature should be a consistent 65F to 70F (18C-21C), which means the daytime air temperature should be in the region of 80F (26C). The warmth and early season rains aid with the seed germination and seedling growth. Horticulturalists advise that warm season grasses can be planted no later than three months before the first frost of winter. These grasses love the sun, and when the winter comes lie dormant so that 90 day period is needed for the new seedlings to be fully established. Before any seeding can be done the site of your new lawn has to be prepared. The area must be graded to ensure there is adequate drainage, and the grass will be easy to mow. The recommendation is to slope grass away from buildings with a one to two percent grade. Anything steeper can cause lawns to dry out. Try and fill in any depressions in the site as these can create wet spots, making the area prone to disease, and also are more difficult to mow. If you intend to replace turf that is already in place, then this needs to be cleared before work on the soil beneath can commence. Most hire shops will be able to provide a sod cutter to remove the old grass and the roots. Alternatively, you can spray with a herbicide to kill off the grass, making sure you avoid any plants or grass you want to keep. Once the grass is dead, it can be removed and disposed of, and any work to prepare the grading of the site can be undertaken. Getting to know the dirt you’re planning to seed takes away a lot of the guesswork involved in planting a new lawn. If you optimize the soil conditions, this will promote successful seed germination and your grass will grow quickly and healthily giving your yard a perfect turf cover. Test your soil for its pH level. Getting the right pH in the soil is critical to your success. The majority of lawn grasses grow best in soils that have a pH between 6.0 and 7.5. A reputable soil laboratory will be able to check the pH level for you if you provide them with a small sample of your topsoil. The results will give you a good indication of the pH level in the soil, and the types of nutrients and their levels too. The report should also provide recommendations on how to get the balance right for perfect lawn cultivation. Getting the right pH level. If the test results show the pH level of your soil is outside the recommended range, then the adjustment can be made with additives to the soil. If the soil is alkaline and has a higher than recommended pH level, sulfur is recommended to bring it back into range. If the pH level is low and the soil is more acid, then the application of lime will increase the pH accordingly. Feeding the soil with nutrients will also promote healthy germination and seedling growth. A good quality lawn fertilizer will make sure there are enough nutrients in the soil for initial growth. Lawn starter fertilizers contain phosphorus, and some places have environmental restrictions on its use. The consistency of the soil is important too. Soil that is very sandy, or dense with clay and compacted can both have an adverse effect on seed germination and the growth of your lawn. If you want a healthy lawn the soil should have sufficient aeration to contain the nutrients and moisture that grass needs to grow. Make sure the soil is as free from rocks as possible, and add some good compost to a depth of two or three inches before seeding. It’s not a bad idea to go over the area with a mechanical aerator. These can be hired from local home improvement or garden centers. This is where advice from your garden center will be invaluable. You probably have a good idea of whether you are looking for a cool or a warm season grass seed. However, other factors come into play when choosing the best seed for your lawn. The amount of sunlight it will get, how shaded it might be, how much watering you able to do, all have some bearing on your choice of seed. Some seeds have been specially bred to conserve water and are drought resistant should you want to grow a lawn in an area where water is at a premium. There are also seeds formulated to live in the shade, and others for more varied sun conditions. Talk this through with the experts, so you get the best seed for your particular circumstances. Once the surface has been smoothed and the soil prepared, it’s time to begin seeding. Each seed manufacturer has a recommended seed distribution rate. Getting this wrong and cause problems with the lawn such as bald patches or clumping. For small lawns of less than 5,000 sq ft (450m2), it’s best to use a drop spreader. As you probably realize this drops seeds in the path of the spreader as you walk over your lawn. It’s easy to use in tight spaces and gives accurate seeding. For more extensive areas, a rotary or broadcast spreader is probably better. These come in handheld or walk-behind types, which both spread seed by uniformly fanning it out in all directions. They lack the accuracy you get with the drop spreader. Having spread your seed now, it is important to rake it into the soil, making sure it’s about a ¼ inch under the surface. Any deeper and the seeds will not get enough sunlight to germinate. Finally, run over the area with a roller to make sure the seeds have adequate soil contact. To successfully germinate grass seed getting the moisture balance right is very important. The soil should not be too soggy, and not dry out. The newly seeded areas should be given a light spray of water two or three times a day to keep the seeds moist and promote germination. If you see puddles on the soil surface, then it’s time to stop watering. As the grass germinates and seedlings begin to appear, the frequency of watering can be reduced and the quantity of water applied to increase. Once the grass is established, you can go over to a regular watering pattern for your part of the world. The grass is not one of those plants that spring up overnight. Seed germination can take anything from five to 21 days to occur. After that, it could be anything between four and ten weeks before the root system is developed and established in the soil. Experienced gardeners suggest it can be a whole season before the grass is developed enough to take any regular foot traffic. When the seedlings are sprouting about an inch out of the ground look over the area. If there are any bare patches reseed, and repeat until you are happy with the thickness of the cover. Only when your new grass has reached a height of 3 inches (8cm) is it ready for its first mowing. Each grass has a recommended mowing height so try and stick to it. In this first mow, try not to remove more than a third of the grass height, say about an inch. If you cut too much off at this time, you can stress the grass which in turn leads to problems with weed, weak growth, and at worst lawn disease. For cool season lawns, this first mow is not likely until the spring following planting. For proper growth using warm season grasses, wait until the following spring after planting as well. 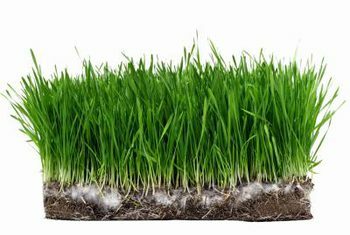 However, you can begin adding fertilizer about a month after germination for cool season grasses, but do not apply any later than November. For warm season planting, wait until the following spring. Try and avoid as much foot traffic in the early years of a new lawn so the grass can establish a good root system, and only water as needed to supplement the rainfall. This is not a project that will show results overnight, as from start to finish you can expect to have a lawn in anything between six to twelve weeks depending upon your climate. Preparing the ground for your lawn will depend upon the size of the plot, but for most people, it can be achieved in a weekend. Seeding takes a few hours. The watering should be as 10-minute task a few times a day in the early days of your lawn growing, which will reduce as the grass become established. Fertilizing should take about an hour three to four times a year, depending upon the type of grass planted. Mowing can be done as required.